We’ve been out of town since Wednesday for Thanksgiving, so I’m just now getting to put up my bump post for the week! Size of Baby: According to Baby Center, she’s just over a pound and almost a foot long (about the size of an ear of corn). Maternity Clothes: Pants are definitely required…I can wear pajama pants around the house still, but maternity pants only in public. I might have a few shirts that I could still wear, but I’ve been wearing all maternity this week! Belly Button In/Out: Still in, but definitely stretching. Movement: She has her bursts of energy throughout the day, especially first thing in the morning and later in the evening. I’m still suspicious that she’s active during the middle of the night. I might go a few hours during the day without feeling her…I’m thinking she has her days and nights mixed up! 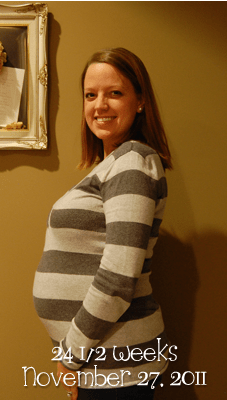 Sleep: I didn’t take my pregnancy pillow with me this week, and I could tell…I was sore without it and I tried to roll over on my belly in the night. What I am looking forward to: Our 4D ultrasound is next Tuesday! Cravings/Aversions: I’ve been really wanting water this week. Symptoms: Developing a waddle, especially if I’ve been on my feet all day. Some shortness of breath (in the mornings), almost like she’s up in my ribs during the night maybe? A little more tired than normal too. Best Moment This Week: Seeing a lot of the family, and letting the grandparents feel her kick!